EasyTurf products are designed and produced at FieldTurf’s world-class manufacturing facility in Calhoun, Georgia. EasyTurf products meet stringent and demanding quality standards, because we control every step in the process. That’s why we can offer a 15-year manufacturer’s warranty that’s non-prorated, meaning the warranty doesn’t lose value over time versus a prorated warranty that declines in value throughout the term. You can transfer your warranty. Companies in the artificial grass industry come and go, and that’s bad news for warranty holders. A warranty of any length doesn’t hold much value coming from an unproven “here today, gone tomorrow” artificial grass vendor. If the turf vendor that sold you the product goes out of business, who do you call? Las Vegas Artificial Grass Pros products drain in an entirely different way that competitors’ products. In order to prevent your turf from having serious problems, choosing superior drainage is a necessity. 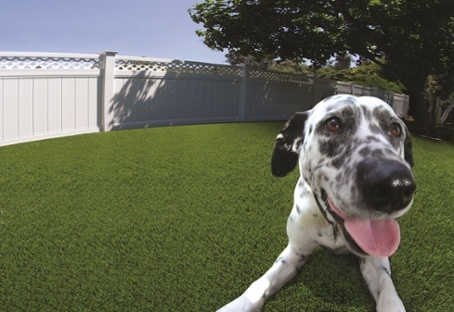 Without that, your artificial grass is vulnerable to mold, water damage, mildew, pungent pet odors, and several other problems. In the video to the right, we show you why Las Vegas Artificial Grass Pros’s drainage is second to none.